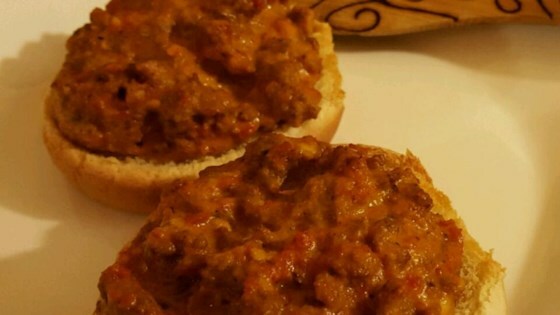 "Open faced burgers with two kinds of meat and cheese in a tomato sauce. Wonderful recipe for birthday parties, football parties. You can also store meat mixture in the freezer for a later date! My whole family loves them. Very easy to make!" In a large skillet over medium-high heat, cook the ground beef until evenly browned, stirring to crumble. Drain fat, and set aside. Process the luncheon meat, cheese and onion in a food processor or run through a grinder until finely chopped. Transfer to a large bowl. Stir in the browned beef, tomato soup, tomato paste, garlic salt, and oregano until well blended. Spread a couple of spoonfuls of the meat mixture onto each bun half, and place them on a baking sheet. Bake for 10 to 15 minutes in the preheated oven, until the meat is hot and the bun is crisp. See how to make gourmet hamburgers with blue cheese mixed into the patties. this is the recipe ive been looking for since i was in high school... many years ago..(wont tell how long ago) big hair was in style. the recipe is awesome.. and will make often. This dissappointed me very very much. Tasted nothing like a pizza, it was very sour tasting and very salty. The topmato paste and tomato soup is too much. Also did horrible things to my stomach. This is the recipe I've been searching for! Thank you so much, these are exactly as I remember from high school--we love these! I loved this; instead of ground beef, I used extra lean ground turkey, then I added turkey pepperoni and fresh parmesan, in addition to fresh basil and oregano. This is a huge hit. I omitted the spam, add chopped green olives with pimento. They were great.